When designing and setting up home gyms, convenience should be a key factor. Think about the reasons why you enjoy going to the gym. In most cases, all the exercise equipment you need is right at hand. You have easy access to weights if you want to focus your workout on building strength, but you can just as easily hop on the cardiovascular equipment if that strikes your fancy. Your goal, when building a gym in your home, is to replicate that convenience. If your gym is not easy and convenient to use, chances are you won't use it! And while you might not be able to fit tons of exercise equipment in your house, a well-planned home gym can yield excellent results. So where to start when creating your home gym? At the very least, a basic home gym comprises an exercise ball and a set of weights, plus a step bench and some exercise videos or DVDs. You can get a good workout at home for very little money with a jump rope, some room to run, a good set of stairs, and some weights. Or you may want to pull out all the stops and purchase equipment such as exercise bicycles, weight benches, and treadmills. Rather than buying several fitness machines, many people are opting for multi-station home gym equipment, which enables users to perform a variety of exercises on one compact exercise machine. But with all of the choices out there, how do you know which gym equipment to buy? Multi-station home gyms provide health club quality strength training in the comfort of your home. Each home gym model features the ability to do a different set of exercises, and offers a strength building workout for the entire body. As the name implies, multi-station home gyms enable more than one person to work out at once. Look for equipment that has a natural resistance feel and uses weight racks rather than relying on bands or bows. A good machine should have at least 150 to 200 pounds of weight available. Good quality cables and pulleys are important to ensuring longevity. Finally, look for a gym that has ergonomic features. The location and shape of the pad, pop pin and pivot point should feel comfortable and natural. Most home gyms enable you to perform twenty to thirty different exercises, but the lower-end gyms often require adjustments and cable rearrangements between sets. Quality home gyms usually have a bench press station, a cable station, an ab crunch station, low and high pulley stations, a leg extension and curling station, and a leg press station. Each station can be used for several different exercises. 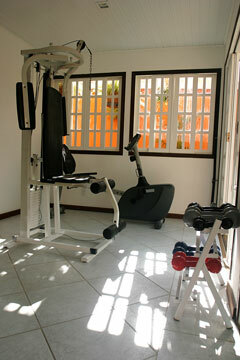 HomeGyms.us features convenient access to popular fitness equipment suppliers and home gym manufacturers. Here you can review gym manufacturer specifications and shop online for the latest in home exercise equipment. Offers dynamic strength training equipment that sets an industry standard for quality and innovation. Features an extensive line of fitness equipment and home gyms. 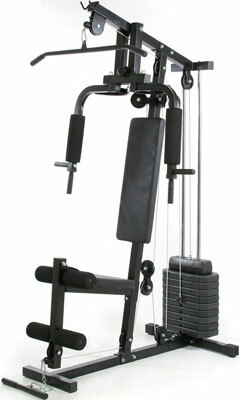 Offers cardio and strength fitness equipment for the home. Find gym systems, free weight systems, and specialized workout stations. Supplier of professional quality home gyms. "Your home fitness solution." 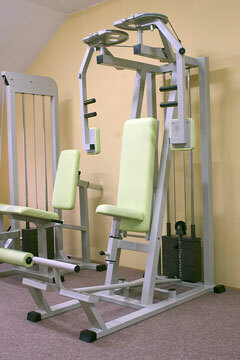 Manufacturer of quality home gyms and free weight equipment. Find an extensive line of fitness equipment including strength machines, treadmills, stationary bikes, ellipticals, steppers, and wind resistance machines. Exercise Bikes - stationary exercise bicycles. Ellipticals - elliptical cross-training machines.